Rosita Holmes "takes the cake" at the Emerging exhibition at the Gosford Regional Gallery. There was a good crowd at the Newview Gallery in Newtown last Thursday for the opening of the eO group exhibition Re-VIEW. The concept of “boxed” art was developed by Sharyn Walker, Betty Saez, Fiona Doyle and the participating artists from the Central Coast. The “art box” as a form has an established pedigree, with precursors in the Cabinet of Curiosities of the 17th Century. 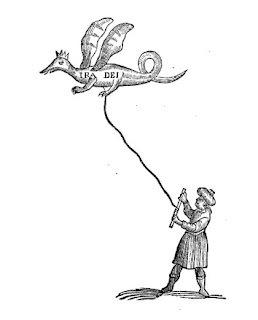 Examples being those made by Ole Worm and Athanasius Kircher, whose collections of strangely juxtaposed artefacts were studies of the prescientific material and philosophical understanding of their day. Interestingly, Kircher is the inspiration for a quirky blog, which recently posted items about anthropodermic bibliopegy (or the practice of binding books in human skin), albino koalas and Esperanto horror films. In the 20th Century, the “art box” was most often concerned with the psyche and identity, reflecting the powerful role psychology has had in our understanding of experience since Freud. Duchamp’s concept of the “Ready Made” haunts many artists’ boxes. His Green Box (1934), a compilation of papers, images, and handwritten notes on the Large Glass, while referencing art practice, as do all choices of form, also embodies contradiction and multiple meaning; dilemmas which are at the heart of individual psychology. For Joseph Cornell (who assisted Duchamp in the manufacture of some of his boîtes), the box became the central form and process of his entire oeuvre. Cornell’s work often incorporated surreal dream-like juxtapositions. Robert Rauschenberg is another artist who found the box a useful form and his approach, as with the use of materials by Duchamp and Cornell, is also echoed in some of the works in Re-VIEW. Rauchenberg used the box to give personal significance to a jumble of common objects and materials. He described them as an “unpacking” of materials in contrast with Cornell’s delicate “packing” of objects in his box constructions. The works in Re-VIEW could be said to be “unpackings” of inner worlds; worlds of memory, nostalgia, desire and existential emotion. Congratulations to all who contributed. Ant angst in a box. Pam Johnston has been active in the women's movement as well as in Aboriginal and prison issues for many years. She is a visual artist, activist, community artist, lecturer and author, and has won the International Women's Day Women's Electoral Lobby Edna Ryan Award for services to her local community, and the Women in Art Fellowship from the New South Wales Ministry for the Arts. 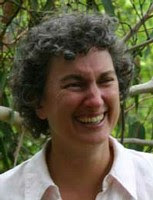 Dr. Johnston obtained her Ph.D at the University of Wollongong,the first Aboriginal person to do so. Creatively Johnston seeks to explore the inner sense of how humanity gives life meaning, particularly after devastation, trauma and death. She has exhibited extensively; the Gandangarra mosaic in Macquarie Street, Liverpool in the Sydney area, is perhaps her most well known work. Congratulations to the successful candidates in the state election. We in the arts community look forward to working with you to advance circumstances for a vitalised contemporary art milieu on the Central Coast. Particular thanks to grant McBride for articulating his vision for this agenda prior to the 24th and to Marie Andrews for her committed response to needs in this area in the past. As the member for Gosford I am sure she will be central to achieving the communities objectives as the “City” plan is negotiated. Integration of art (and the opportunities for new perspectives that it offers) into the spaces places and processes of the town, needs to be understood as fundamental. Art will not achieve its potential if it is considered a peripheral life-style accoutrement or part of the entertainment industry. Finding a place for art in the city. 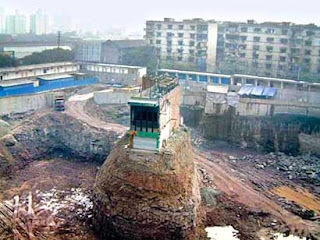 A Chinese court has ordered that a villa left isolated in the middle of a man-made 30ft pit be bulldozed within three days. 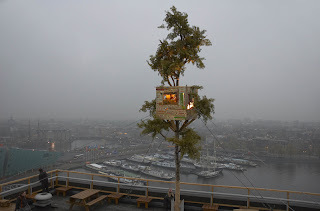 »Under Heaven« (9m Tree with treehouse on 45 m high Stedelijk museum) by Leonard van Munster. Message received from a few artists who were at Gosford for the Dawn Light Symposium (Alison Clouston & Boyd, and Margaret Roberts). While it is not about Arts Policy, I will post it on their behalf as received. we (Alison and Boyd) are making a postal vote so have the upper house ballot papers. on the form as such because they are not a political Party. If elected they intend to be proactive on Climate Change. On other policies they will take a conscience vote. They have no preference deal with other parties. It is disappointing that the Liberal and Labor candidates for the electorate of Gosford have not offered us an opportunity to consider their art and culture policies before the March 24th election. This is not only a discourtesy to the many constituents that are involved in the arts at a professional and community level, but indicates a low ranking in these candidate’s priorities for the cultural sector. It also indicates that the art community has much to do to educate those who would represent us. Perhaps it is not surprising that the major parties, whose campaigns are so tightly managed and “presidential” were the ones whose candidates adhered so strongly to the script. A check of the Labor and Liberal websites could find no arts policy on either. Which makes the “Policy” contribution by Grant McBride all the more appreciated, both as a demonstration of responsiveness to constituent initiatives and as a commitment to the development of dialogue about the future of art and culture on the Central Coast. Considerable time and effort was put into preparing and tailoring his policy statement for the region. We hope his "policy" will be read by many in his electorate. Grant however is not a candidate in the Gosford electorate, which was our focus. Debra Wales, Independent, stated honestly her limited acquaintance with art and culture matters, but indicated a willingness to respond to issues raised by any constituents. Her courtesy in responding to our invitation is also much appreciated. Hillary Morris, Greens, produced a thoroughly researched policy in terms of local priorities, as identified in the Vision 2025 Council document, and clear support for freedom of artistic expression. 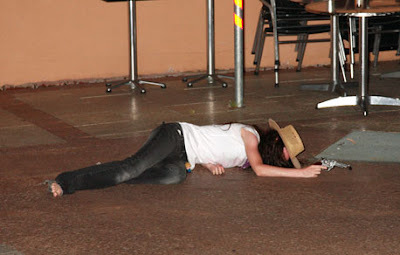 We respect and appreciate the efficiency with which she responded to the invitation to present her policy. It is also significant to note that the Greens alone have a detailed Arts Policy on their website. Of the candidates in the Gosford electorate, Hillary has given us the most comprehensive policy to consider, and a clear indication of her commitment to the future development of art and culture for the community. 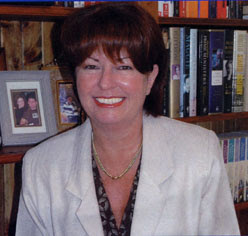 Marie Andrews, in the old electorate of Peats, has a reputation as being responsive to the electorate and a hard and dedicated worker. She made effective representation to Bob Carr (then Premier and Minister for the Arts) when attempts were being made to establish a contemporary art centre at Mt. Penang. Their silence on this occasion is cause for disappointment. We will be running this invitation to candidates to present Art and Culture policies in all future elections, so the task now is to work with them to raise the profile of art and culture in the region, and to ensure that we have policies that include new genres of emerging practice. A final reminder has been sent to Liberal and Labor candidates for the seat of Gosford. We hope to have a complete spectrum of responses to our invitation on the Back Page by Wednesday the 21st. We apologise if our omission, by not inviting the Christian Democrats, Save Our Suburbs and Australians Against Further Immigration candidates, has disappointed any readers. A brief explanation for the omission. It is difficult to get useful information about single-issue parties with names like slogans. A Google check of AAFI found no website, several mentions of de-registration and suggestions of racism. Xenophobia is not an immigration policy; Population policy is far more complex than simplistic practices of exclusion; Cultural chauvinism is not helpful in any arts and culture policy developed for an increasingly globally-aware contemporary art community. SOS (Save Our Suburbs) is another group with no discernible concern for art practice. “Save Us From the Suburbs” might be getting closer to an Arts Policy. Caps on population and resistance to rapacious development might be notions worthy of discussion, but that is not our purpose here. Fred Nile’s Christian Democrats likewise seem to have no Arts agenda, other than trying to close down exhibitions they object to, as was evidenced recently at the Gosford Regional Gallery. For other attitudinal pronouncements (e.g. on Muslims), see AAFI thumbnail above. Bigotry is not an Arts Policy. [editorial disclosure] I do not believe belief in belief necessarily results in good. Holding a belief is a personal issue which will inevitably influence the way an individual acts as a politician, but I regard the separation of Church and State as being important in a democratic system that depends on the principle of debate, scrutiny and rational argument. Unchallengeable supernatural premises are fine in their place and might even produce outcomes beyond the limitations of the rational (martyrdom for example or a will to survive). If people believe in angels and/or aliens (and apparently the majority of Americans do) that is fine. But does it provide a desirable foundation for making decisions on, for example, the privatisation of public assets. Speaking of Alien political policies, A Finnish Member of Parliament is aiming for re-election by campaigning with a translation of his website into Klingon, according to a Reuter’s report. He said his politics posed some translation difficulties, since Klingon does not have words for matters such as tolerance, or for many colours, including green - the party under whose banner he is running in the national elections on March 18.
yIrqI' yIy yIy qaSvI' 'oH pongwIj'e' 'ej vInlan yejquvDaq jIjeS. pa' DIvI' SuDqu' vI'oS. pe'vIl parmaq vIvoq. qo' vIDub vIneH; motlhwI' vIqaD vIneH; ngoch ngachlu'taHvIS qechmey chu' vIchel vIneH. jIHvaD Daj qechmeyvam: De' nugh, vummeH mIw patlh, DuSaQ'a' ngoch, 'oghmeH toDuj je; nIb Hoch ghotpu' DuHmey 'ej pImwI' cherghlu' 'e' vIqel je. As you can see, not much about the arts there! Received from Debra Wales - Independant. "My apology for not getting back to you. I looked at your questions and I will be honest with you – I can’t answer your questions because I’m only involved in the Arts in a very small way. What I will say is that I believe a true representative of the community does not tell others what they should have, but listens to what the community wants and represents them fairly and with integrity. I give my commitment that if elected I will represent you strongly in the goals you have for the Regional Performing Arts and the new Arts Precinct. "I have attached some words from Grant about our arts policies for the Central Coast. Thank you for your patience, I hope this information is useful." Although not in the Gosford Electorate, Grant McBride was invited to contribute as Minister for the Central Coast. NSW Central Coast, priorities for the arts in Gosford and Wyong region. 1. What are the priorities in planning the future for the arts in the Gosford region? * The need to develop regional cultural infrastructure particularly in the performing arts. The approach for cultural development on the Central Coast must reflect what the community wants, the demographics of this region (eg youth, aged) and also the 'spirit of place'. The recent opening of the Youth Arts Warehouse in Gosford is an example of the Iemma Government responding positively to the need for arts resources for particular groups within the community. 2. What do you consider to be the greatest needs? The region's cultural development should be seen as being not only about building infrastructure but also programs. Gosford Council's cultural plan sensibly identifies the need for new entertainment precincts and outdoor sites such as the highly successful Live Sites model in Newcastle. Arts NSW is keen to pursue this, possibly as part of the role for a cultural broker. I also see the need for whatever is being pursued in Gosford for cultural development to have the benefit of the State Government's thinking and actions on the development of the creative industries. Arts NSW will work with the council(s) on how this can be achieved. The demographic features of the region also identify key needs, in particular the high concentration of young people. Regional arts development should build capacity in the community support networks which work with the cultural organisations and facilities to engage young people, particularly in relation to music. Initiatives such as the Youth Arts Warehouse are being encouraged to progress these networks and provide potential employment in the arts in the region. 3. Is the Central Coast well resourced now? * NAISDA, the National Aboriginal and Islander Skills Development Association, re-located to Mt Penang in 2006 with assistance from Arts NSW. The Youth Arts Warehouse is an example of a recent Iemma Government commitment to the arts on the Central Coast. I lobbied particularly hard for support for this project, which will be of great benefit to our creative young people. I will continue to lobby for greater arts resources on the Central Coast. 4. What are the strongest and weakest aspects of art culture locally? The strengths and weaknesses of local art culture go, in some ways, hand-in-hand. The arts community on the Central Coast is vibrant and close-knit – which means the challenge still exists to promote involvement in the arts to more people. Through NSW Government programs, we are working hard to see more and more people take part in cultural events. An example of this is a recent grant of $2500 from Arts NSW to Regional Youth Support Services in Gosford, through the Indent Program. This program provides funds for youth music events, organised and patronised by young people. The funding offered to RYSS will allow three live music events to be held in Gosford. Hundreds of young people are expected to attend these events and many young local bands will take part. The events will give young musicians a rare opportunity to show-off their talents and younger music enthusiasts can enjoy a local cultural event. We have also had a welcome addition to the Coast’s festival scene which I believe can offer more local exposure to the arts - and also promote the arts scene on the Central Coast to a broader audience. The Central Coast International Guitar Festival was very successful in its inaugural year in 2006 and I was proud to support the event. It attracted a very diverse range of musicians all with the common love of the guitar and many enthusiasts both from the Central Coast and other regions attended the event. As Minister for the Central Coast, I look forward to helping this event develop further and become a feature event for the region. 5. What are the benefits to the community of art? How would you rank them? The arts give communities the opportunity to tell their stories, to build creative skills, and to be active participants in the development of their culture, to create a sense of identity and belonging. The Creative Industries is a growing sector at both local and global levels. I am especially pleased that opportunities for young people on the Central Coast to express themselves through art have been expanded, via the recent opening of the Youth Arts Warehouse. I see this project as a great chance to nurture our artistic talent and provide a positive outlet for the creative energies of our young people. By providing our young people with worthwhile projects to engage with, we are able to mitigate problems with anti-social behaviour. 6. How would you rank art in relation to other sectors of community and civic life? Under the NSW State Plan, Environment for Living is identified as one of the five major themes. The arts are ranked as one of the key priorities for Environment and Living. On the Central Coast, there are numerous examples of the importance of the arts to our community and civic life. For some years now, I have been involved with the Central Coast Festival of the Arts, the region’s longest-running and most prestigious art event. Last year the event was opened by Premier Morris Iemma, and the year before that by NSW Governor Professor Marie Bashir – an example of the NSW Government’s regard for the arts. I believe the festival is one of the best events of its type in NSW. It is always well patronised, and is instrumental in establishing a strong sense of culture and community pride – as well as promoting healthy debate. 7. What are the key priorities for the arts in the Gosford City Plan (what and where)? 8. What is your attitude to the presentation of controversial and perhaps disturbing contemporary art works? The organisations which Arts NSW funds are independent, often with boards that have responsibility to their communities for how contemporary standards are applied and interpreted. While Arts NSW' funding is directed to such organisations to program at the highest professional level, programming decisions are for them to make. Community and cultural organisations can consult the Arts Law Centre of Australia which is supported by the State and Commonwealth Governments to provide specialised legal and business advice and referral services, professional development resources and advocacy for artists and arts organisations. 9. What funding and infrastructure resources would you seek to secure for sustainable development of the arts in the region? I want Arts NSW to begin discussions with the councils using their cultural plans as a starting point for a possible regional arts development strategy. A cultural plan must be backed up by strategic and business plans and a partnership approach with other levels of government. Arts NSW brings substantial experience, skills and knowledge on how regional arts development will be best pursued, and has forged very effective links with the Dept of Planning that will enable the cultural development of the Central Coast to be linked with broader planning issues. NSW March 24 Election. Arts Policies. All candidates for the Gosford electorate were invited to share their vision for the region by presenting their election policy and responses to some broad questions. The first to respond was Hillary Morris of the Greens. What are the priorities in planning the future for the arts in the Gosford region? To facilitate community access to the greatest variety of artforms within the region, with emphasis on Indigenous culture, community arts as well as ‘high’ arts such as classical concerts, art exhibitions – both sourced locally and travelling exhibitions – drama and dance. To emphasise a unique regional culture and encourage different perspectives including celebration of our natural heritage. What do you consider to be the greatest needs? The greatest needs are for music performance, dance and drama – there is no concert hall in Gosford and a multi-purpose centre could include not only a concert hall suitable for visiting performers as well as local performers such as the Central Coast Symphony Orchestra, but also smaller rooms for performances such as poetry readings, small ensembles and dance, and rooms for community arts and crafts. Is the Central Coast well resourced now? Gosford Council has taken its arts role seriously; it has a Cultural Plan and it oversees a number of initiatives including festivals that engage the community. However, there is need for greater investment in the arts. Gosford Art Gallery is very attractive but it is small and it could be expanded to house larger exhibitions and perhaps develop a permanent collection. The venues for music performance are inadequate and a concert hall is needed. Drama is served by Laycock Street and the Little Theatre but these venues are not easily accessible by public transport, and with an expanding population, they may prove to be inadequate in size. What are the strongest and weakest aspects of art culture locally? Community arts are strong but there are limited opportunities for maintaining professional ensembles due to lack of funding. What are the benefits to the community of art? How would you rank them in terms of what you would work towards if elected? If elected, I would regard the arts as having a high priority, with an important role in reinforcing community identity and nurturing community well-being. While there are pressing issues such as climate change, the environment, public health and public transport occupying centre stage, I see the arts playing a vital role not only in expressing individuality but also as an important way of conveying messages of change as we face unprecedented challenges such as rises in temperature, loss of species, water shortages and Peak Oil. How would you rank art in relation to other sectors of community and civic life? I would rank the arts highly along with cultural activities as a means of engaging with the community and providing educative and entertainment value, and as a potential source of employment for young people. The arts contribute to community well-being and are valuable for the retired and older people in the community as well as nurturing the creative talents of the young. What would be your key priorities for the arts in the Gosford City Plan (what and where)? Key priority is a multi-purpose cultural facility including a concert hall, smaller rooms for drama, dance and other performance, arthouse cinema, theatre, cafes and restaurants in a purpose-built complex in the Gosford CBD, somewhere on the waterfront. It should include the new Gosford City Library and the Central Coast Conservatorium and it would be linked to Gosford by public transport. It would not only attract visiting performers to Gosford, and establish Gosford as a centre of music excellence, it would also provide a meeting place and a range of activities for the increasing population of the Gosford CBD. What is your attitude to the presentation of controversial and perhaps disturbing contemporary art works? Freedom of expression is fundamental to the arts and the ability of all artists to comment on the nature of our society must be preserved as part of the structure of a just and democratic society. What funding and infrastructure resources would you seek to secure for sustainable development of the arts in the region? If elected I would establish a lobbying team making representations to the Minister and Arts NSW to seek project funding for developments such as the concert hall complex, and on-going funding to support community arts and other developing initiatives. Back Page wishes to thank Hillary for being first ‘cab off the rank” and for the time and consideration she has given to the questions. She would also like to draw your attention to the NSW Greens’ Arts Policy on their website. Jenny Brown's statement about her work. powerlessness for many within this system. Image is of documentation of public art work displayed in Art First exhibition at Mt Penang Institute of Contemporary Art, 2004. Liz Wright, Fiona Doyle, Sharyn Walker, Betty Saez, Kiera O'Toole and Josephina Laina. A. They are all members of eO inc., the Central Coast contemporary art initiative. As the only incorporated non-profit organization in the region dedicated to contemporary art, it is pleasing to see eO growing so well as an organization and to have their individual members enthusiastically joining in other projects, such as this.